Market News: You can see the last Market News. Technical Analysis: You can see the last Technical Analysis. To select the instruments that you want to receive signals you just need to allow the "Push Notifications". 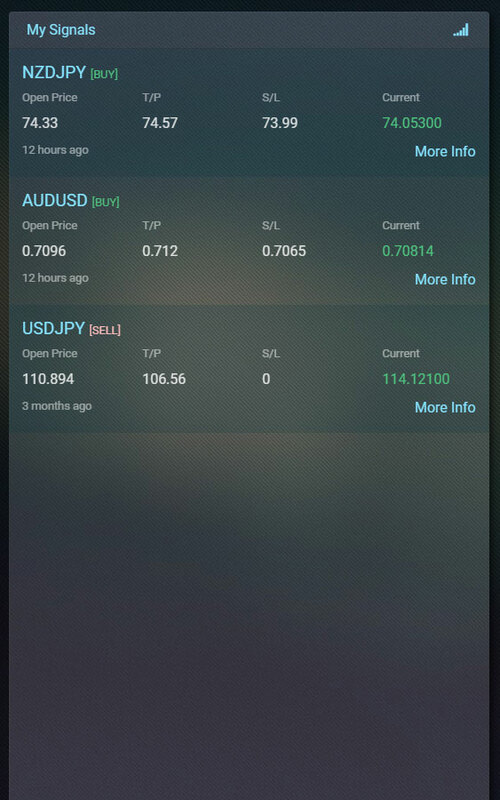 All the instruments you have allowed for "Push Notification" will be visible on "DashBoard" as "My Signals"
In Active Signals you can see all open positions. My Signals shows signals of your selected Instruments from the "Instrument Settings" menu. All the instruments chosen to receive the "Push Notifications" are marked as "My Signals"
Green Signals are closed with prof it. Red Signals are closed with loss. 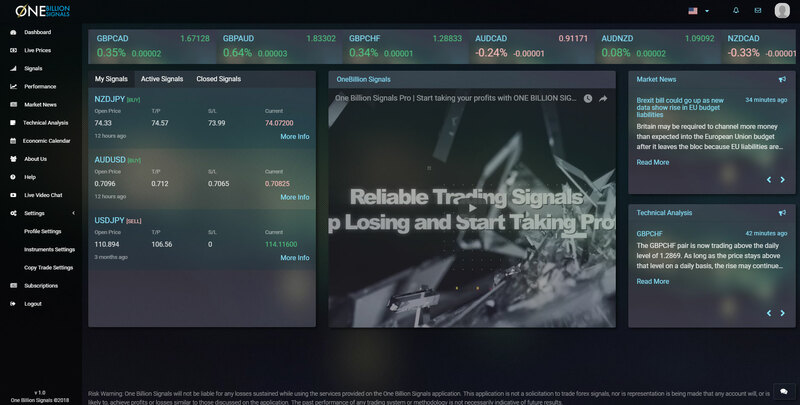 You can see the performance of the signals on this page. Choosing one of the products from the list, you can see the detailed historical chart with the performance of the signal. Graph: is shows the historical results of +TP and -SL with pips. Signals : You can see the last signals with chosen product. Daily trade in FX which the time duration between entry and exit is within hours and target is less than 28 pips. Short-term trading can be very lucrative, but it can also be risky. To succeed at this strategy, traders must understand the risks and rewards of each trade. Controlling risk is one of the most important aspects of trading successfully. Short-term trading involves risk, so it is essential to minimize risk and maximize return. 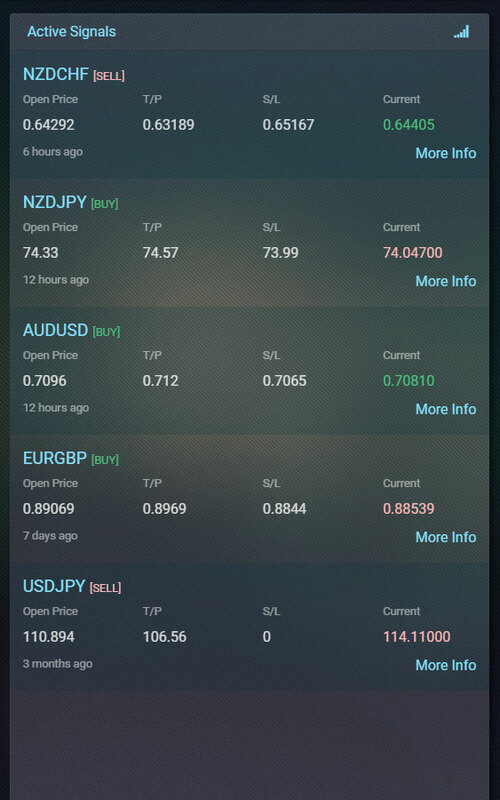 You might receive multiple trades in same currency depending upon the current condition of the market. 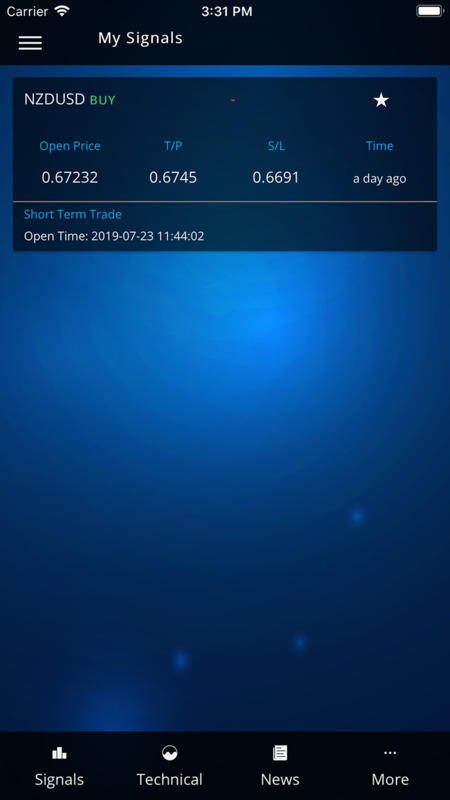 Invest for the long term in FX which refers to holding a positions for an extended period of time and target is more than 57 pips. Controlling risk is one of the most important aspects of trading successfully. Due to the nature of the long-term trades, stops would damage your account, if you don't control your risk. To hold positions for one or few days in FX and target is between 28 and 57 pips. Controlling risk is one of the most important aspects of trading successfully. Please be aware that you control your risk carefully in mid-term trades. • We monitor the Forex (FX) market 24 hours a day and look for BUY / SELL trade opportunities for you. • We analyse the market and give signals when the opportunity occurs. We have more than 50 products to follow whlch are FX and CFD products. Please choose your products under SETTINGS section and follow our signals. 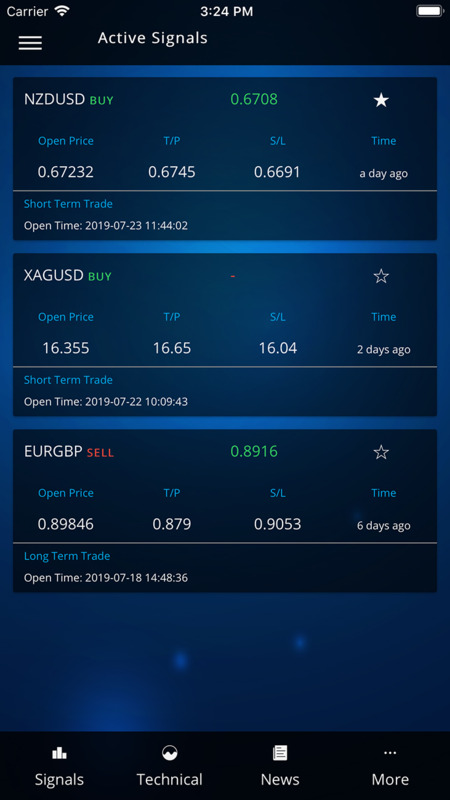 • When we identify a trade opportunity, you’ll have a notification on your mobile device, to be able to get the notification you must sellect your products under the SETTINGS section. You can also have an e-mail alert. You will receive the signals with Entry Point, Stop Loss and Take Profit Targets. • Follow us on the road, at home or wherever you are. All you need to do is download our application. You will be informed anywhere, anytime. • By using SETTINGS section, you can select the options how to get the alert either by notification or email or both. 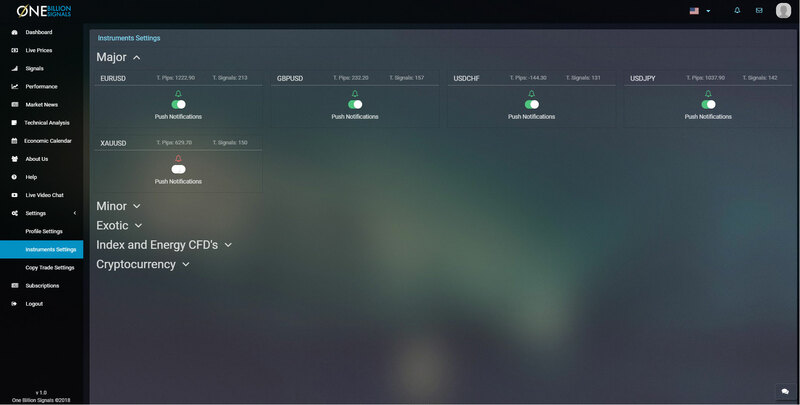 • You will always see our performance and past trades by using the PERFORMANCE section. • You will see all active signals by using the ACTIVE SIGNAL section, remember all the signals will be listed here whether you follow or not. • On MY SIGNAL section you will be able to see your signals that you have choosen from the SETTINGS section. 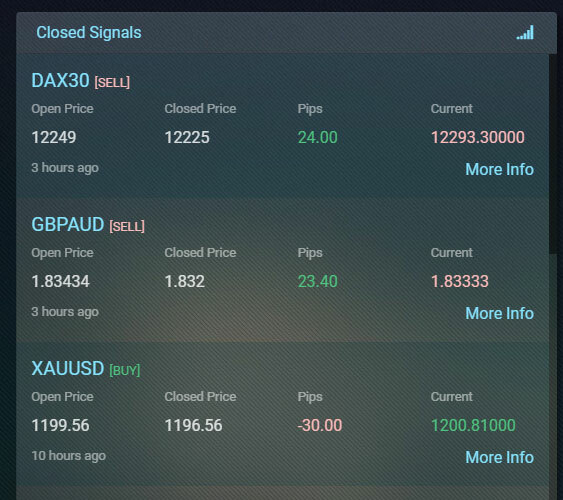 • In CLOSED SIGNALS section, you will see your closed signals with date, price, take profit and stop loss data. Remember, you receive these signals as we enter the system. So you can always be sure that we are trading simultaneously as we send the signals. • OneBillionSignals also offers real-time streaming market news and economic calendar. Due to the nature of the algorithmic trade system, there can be BUY and SELL signals in a product at the same time. If the products price fits market conditions and there is room for a profitable trade, we would give multi reverse signals. That would be long-term or short-term perspective. With that in mind, the signals both could hit the target or stop loses. You can ask your questions to us trough the live chat on right bottom corner. - My Signals: Shows you only the signals of your selected Instruments. 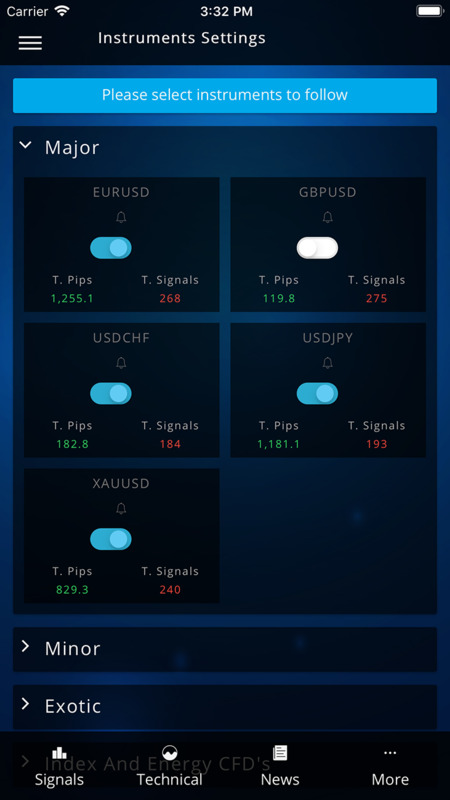 - Active Signals: Shows you all current active signals. 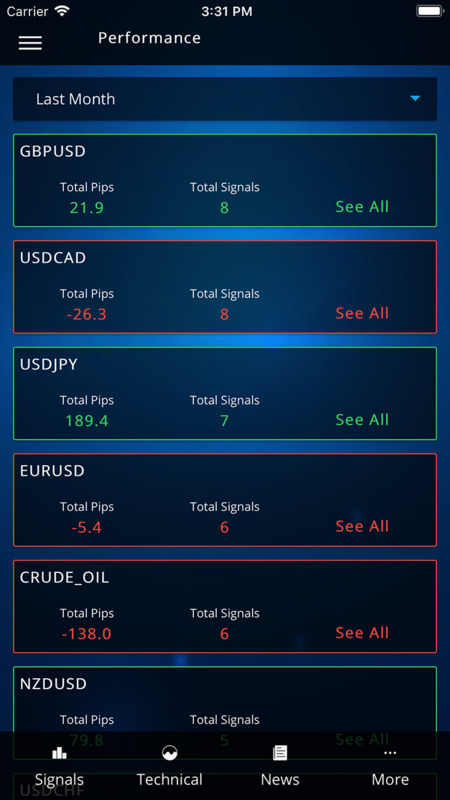 - Closed Signals: Shows you all signals which has been hit the T/P or S/L. You can see the Important Market News are mostly economic news, political climate etc. that can drive currency movements. Also you can search for specific News. Instrument base Technical Analysis created by our experts. We respect and care about your personel privacy. Also we would like to share this article about the careful hiding of your personal information. One Billion Signals Pro will never contact any system, software or company that discloses user information. The data in the application is accessed via secure connections to you. Also we take the data safely from you same secure connections. All instructions in Google Play and App Store are followed. One Billion Signals Pro never contains malicious application. When we update OneBillionSignals Pro we will monitor the google play and app store update guidelines and ensure that the user data policy is not violated. For your own benefit and protection, you should read this Term of Use and all other documentation supplied to you carefully before creating an account with us. If you do not understand any point or are unsure as to the nature of the risks involved, please ask for further information. 1.1. Any reference in this Agreement to “we”, “our” and “us” shall be to One Billion Signals Pro. (OBS). Any reference to “you”, “your” and “Client” shall mean you as a customer of our services under this Agreement. 1.2. Please read the Agreement carefully before Creating an account with us. You should understand that by Creating an account with us, you agree to be legally bound by the Agreement. 1.3. You can accept the Agreement on our website/application by ticking the declaration that you have read, understood and agree to the Agreement. Please understand that if you refuse to accept the Agreement, you will not be able to open an account with us. Client: User who has downloaded, used, or included in any of the membership options. Free Trial Period: OBS provide to its new clients Free Trial Period, which will allow to the new clients, to use its services free after new registration. Subscription: After the end of the Free Trial Period, if the Client wants to use the services provided by OBS, clients need to activate the subscription payment. 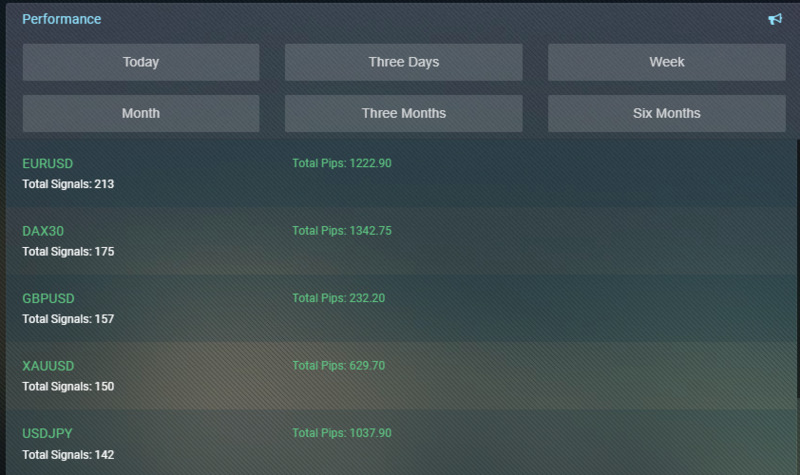 Subscription Options: Subscription details which are declared in OneBillionSignalsPro application or www.onebillionsignals.com website, at Google Play and Apple App Store. 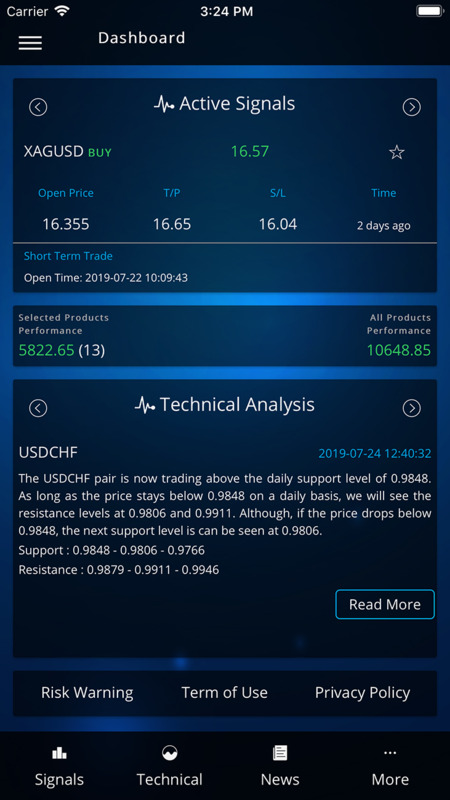 Technical Analysis: is an analysis methodology for forecasting the direction of market prices through the study of past market data, primarily price and volume. Fundamental analysis is an analysis methodology for forecasting the direction of market prices through the study of fundamental sizes of a national economy or a firm in relation to the market and the important political news. This information is used to forecast the market trend and future price movements. Market News: Market News are mostly economic news, political climate etc. that can drive currency movements. Most of the Market News are related to the Fundamental Market News. Economic Calendar: It is extremely important to follow and interpret the data when doing basic analysis. A calendar used by traders for the purpose of tracking the occurrence of market-moving events. Investors will research the date and time of a specific event and pay close attention to the announcement because of the high probability that it will affect the direction of the market. 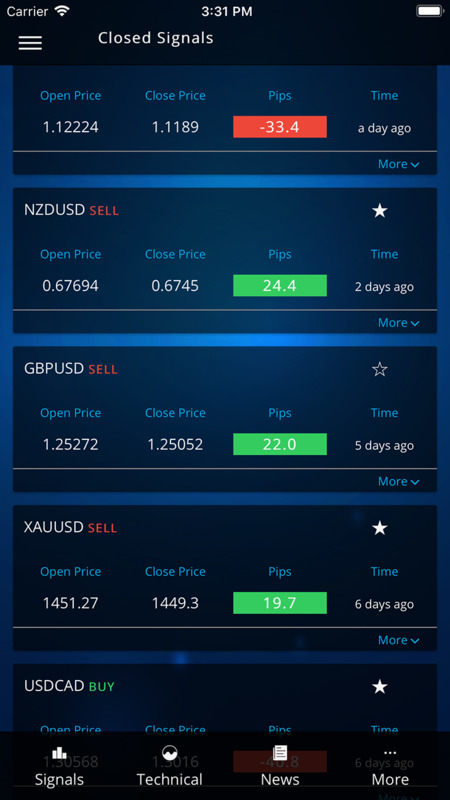 Forex Signals: is a suggestion for entering a trade a on a currency pairs, usually at a specific price and time. Generally, Signals generate by an analyst and they are based on technical analysis and a minority work on fundamental analysis or price action. 3.8. Push Notification and email notification for above services. 4.1. It is prohibited to use, store, reproduce, display, modify, sell, publish and distribute the Services without our prior written permission. 4.2. We reserve all rights of Intellectual and commercial property (including patents, trademarks, copyrights, industrial designs, know-how, logos, designs, slogans and other advertising materials, in all forms whether or not registered) relating to the Services. 4.3. You shall not use the Services for any unlawful or unauthorized purpose. 4.4. The use of the Services requires skill and judgment, and that you shall at all times use the services entirely and only at your personal risk. 4.5. You are responsible for every statement, act made and acts of omission that occurs in violation of the present Agreement while your user identification name (or "username") and password are being used. You are responsible for protecting and securing your username and password from unauthorized use and disclosure. 5.1. You shall receive Push Notification via the Application or Web Platform, after identifying yourself with Your username and password. The Parties hereby agree that they shall communicate by emails and written messages in the Application or Web Platform. 5.2. We shall not be liable for any losses incurred by You due to an inaccurately Push Notification, interruption of the connection or failure of the means of communication. 6.1. This Agreement shall come into effect on the date on which your successful subscription is made and confirmed by Us via one of the Google Play store or Apple App store methods listed on the Website and You accept the Agreement and all attachments to it. This Agreement shall be in force between the Parties until terminated in accordance with article 6.2. 6.1.1. The OBS application only responsible for providing services to a user’s/client, between the subscription start date and end date. 6.2.2. without prior notice in case, You commit a breach of any of Your obligations under this Agreement, including but not limited to breach of article 4.6. 6.4. We reserve the right to terminate immediately the present Agreement without prior notice in cases where we reasonably suspect of abuse this Agreement. 8.1.1. When you receive a notification from www.OneBillionSignals.com on your email, please click on the “unsubscribe from this list” link at the bottom of the email page. 8.1.2. Simply tick the notifications you would like to receive. (If you are no longer willing to receive any notifications, just untick them all). 8.2. Alternatively, you can unsubscribe directly from a certain type of notification by clicking on the “unsubscribe from this type of notifications” link and then click on the “Unsubscribe” button. 9.1. The fact that we have made the Services available to you constitutes neither a recommendation to enter into a particular transaction nor a representation that any product described on the website is suitable or appropriate for you. Many of the products described in the Services involve significant risks, and you should not enter into any action unless you have fully understood all such risks and have independently determined that such action are appropriate for you. 9.2. Customers of OBS are responsible for managing their own risk. OBS is free to decide on the provision of any recommendations on risk management or compounding techniques to its customers. Such information is only provided as courtesy and shall not imply provision of any financial advisory service. 9.3. OBS informs its customer that any statistical analysis related to the performance of the written signals either as a total o related to specific assets is merely indicative and under no circumstance shall be regarded as a prediction of future results. OBS warns its customers that statistical analysis has certain limitations and that individual trading results may vary due to diverse factors such as market conditions, price execution, etc. 10.1. We will not be liable in any way for any loss or damage suffered by you through the use of this website/applications, or our failure to provide this service through the website/application. Our liability for negligence and breach of contract as a result of our failure to provide this service or any part of it, or for any problems with this website and application, is limited to the maximum extent permitted by law, to resupplying this website/application or any part of it to you. 10.2. The content and information included in our Services are provided by us and our third-party suppliers (information providers, for example). Our Services are not intended to provide tax, legal or investment advice, and nothing on the website and the application should be construed as a recommendation for buying or selling any financial instrument. 10.3. We will not be liable in any way for any loss or damage resulting from actions prompted by the content of our Services (for example opinions about the market value of a certain financial instrument), or for any loss resulting from the sale or purchase of any financial instrument, or any other matter. 10.4. OBS Forex Signals is only provided as courtesy and shall not be interpreted as of any consulting service or investment advice. 10.5. OBS Webinars are only provided as courtesy and shall not be interpreted as of any consulting service or investment advice. 10.6. OBS services are not advisable for people who have no knowledge about financial markets and who are inexperienced in money management to use such practice. The website www.OneBillionSignals.com can be accessed worldwide. However, the information on this website is not directed at residents of the United States and is not intended for distribution to, or use by, any person in any country or jurisdiction where such distribution or use would be contrary to local law or regulation. It is the responsibility of visitors to this website to ascertain the terms of and comply with any local law or regulation to which they are subject. 12.1. We shall obtain and hold personal details about you. 12.2. Where agreed by you, we may also use such information for marketing to you and for carefully chosen third parties to market their products and services to you, which we consider may be of interest to you. You may notify us at any time in writing if you do not want us to use or share such information for all or some of these marketing purposes. 12.3. You shall have the right of access, under the relevant data protection legislation, to the personal data that we hold about you. You can request a free copy of such information we hold in line with the General Data Protection Regulation. 13.4. as a result of a requirement under the applicable law and regulation. 13.5. We may change the Free Trial Period increase or decrees the days, or disable the Free Trial Period for marketing purposes. If you are unhappy with the service that you receive from us please contact us via Live Chat or Sent us email with your complaints. We are always here to help you.